1. Preheat the oven to 350F. Coat three 8-inch cake pans with nonstick spray. Line the bottoms of the pans with parchment paper. Spray each pan again and coat with a thin layer of flour. 2. In a large bowl, combine the sugar, flour, cocoa, baking powder, baking soda, and salt. Add the eggs, milk, oil, and vanilla, and mix until everything is thoroughly incorporated. Stir in the boiling water; the batter will be very thin. 3. Divide the batter evenly among the prepared cake pans. Bake for 30-35 minutes, or until a toothpick inserted in the center of each layer comes out clean. Cool the layers in the pans for 10 minutes before transferring to a wire rack to cool completely. 4. Wrap each layer in plastic wrap and refrigerate for several hours or overnight. Make the cream cheese filling and chocolate buttercream (see recipes below). When you're ready to assemble the cake, remove the layers from the refrigerator. If needed, level each layer with a serrated knife or cake leveler. 5. Place the bottom layer on a cake plate. Evenly spread about 3/4 cup of the cream cheese filling over the cake, leaving about 1/2 inch margin around the edges. Top with the second layer and repeat. Finally, top with the third layer. 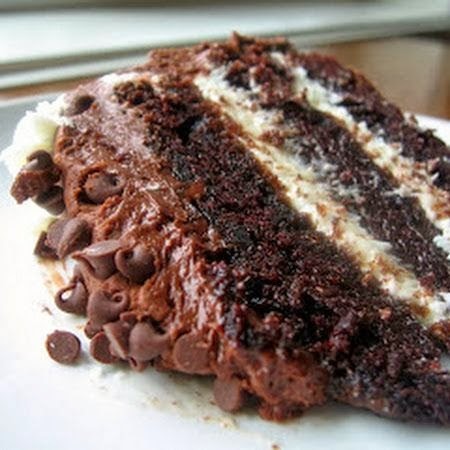 Apply a thin layer of chocolate buttercream over the top and sides of the cake. This is only a crumb coat, so it doesn't need to be perfect. Refrigerate the cake for about 30 minutes. 6. Remove the cake from the refrigerator and apply a final layer of chocolate buttercream, as well as any desired embellishments. In a large bowl, combine the powdered sugar and cocoa powder. Beat the butter with an electric mixer at medium speed for about one minute. Reduce the mixing speed to low, and add the sugar/cocoa mixture about 1/2 cup at a time. Halfway through this process, add the milk and vanilla. Once all of the ingredients are thoroughly incorporated, beat at medium speed for about two minutes or until fluffy..